President Rivlin welcomes Vatican's Papal Nuncio and three new ambassadors to Israel. President Reuven Rivlin during a Wednesday morning ceremony at the President’s Residence in Jerusalem received the diplomatic credentials of the new Ambassadors to Israel from Sweden, Portugal, Uruguay, and the Vatican. First to present his credentials was Swedish Ambassador Mangus Hellgren. Rivlin welcomed him to Israel, and said, he appreciated greatly Hellgren’s experience and knowledge of the region. 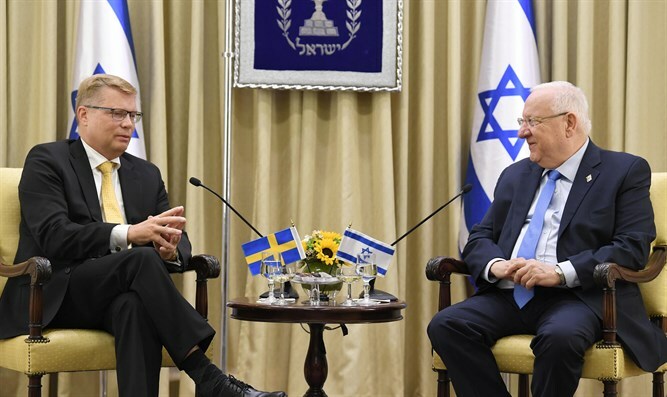 "We in Israel admire the welfare system of Sweden, this is a model of a country's ability to care for its citizens, and to grow and prosper economically," Rivlin said. "In the relationship between our countries, we have of course experienced ups and downs, but we have always remained strong friends. I very much hope that during your term here we will be able to strengthen this relationship even further – both in the political sphere and in our bilateral trade and other cooperation between our peoples." Rivlin also stressed that Israel was prepared to accept criticism, but warned of the dangers of boycotts and politically motivated unilateral moves. He thanked Hellgren for his government’s commitment to the fight against anti-Semitism, and urged the Swedish government to adopt the working definition of anti-Semitism of the International Holocaust Remembrance Alliance (IHRA) in its entirety. Hellgren thanked the President for his warm welcome and said, "It is a great honor to be received here by you today. It is an historic day, as we celebrate the 70th anniversary of the UN resolution which set in motion the process that led to the establishment of Israel." "Sweden was a strong supporter of the idea of creating two states in this region, with a Jewish state for the Jewish people. Our commitment to the two state solution has been steadfast ever since. We have had differences of opinion but that has not stopped us from being a good friend of Israel. We are definitely not supporting any idea of boycotting Israel. We want to see more trade with Israel, not less." He stressed that the Swedish government was committed to Holocaust remembrance and education, especially to ensure that the younger generation understood the dangers of hatred, xenophobia, and anti-Semitism. Next to arrive was Ambassador of Portugal Joao Bernardo De Oliveira Martins Wienstein. Welcoming him, Rivlin said, "For the Jewish people, the Iberian Peninsula is not only a place, it is an idea. It is the wisdom, and the philosophy of the Jewish people, so much of which grew and developed there. We are very proud of being part of the Peninsula for many centuries." 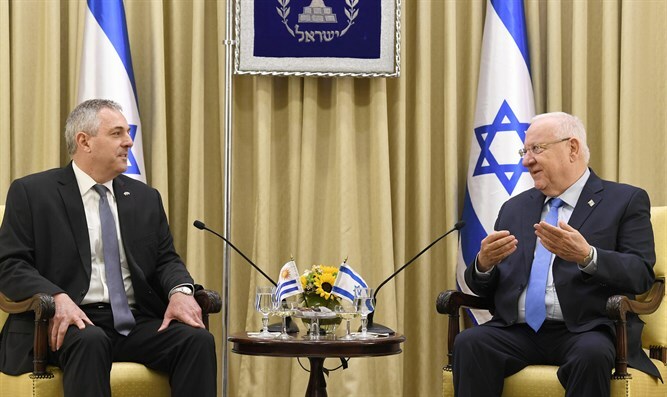 Rivlin spoke of the warm relations between the two countries adding that more could be done to strengthen and deepen existing cooperation in many areas between the two countries. He also said he was looking forward to the opportunity to host the President of Portugal, who was due to visit Israel in 2018. Thanking Rivlin, Wienstein said, "We are so delighted that so many Israelis are coming to Portugal, visiting Portugal, and enjoying Portugal. There are lots of alliances between our educational institutions, and I want to increase the number of cooperation activities between our universities, and our students." Rivlin then received the diplomatic credentials of Ambassador of Uruguay Bernardo Greiver, who was beginning his second term as Ambassador to Israel having previously served in the post between 2009-15. Rivlin welcomed him back to Israel and said, "We know all you have done for Israel, and how you have supported Israel over the years, and we are looking forward to your return." "You are here on a very special day," Rivlin said, noting the important role played by Uruguay’s Ambassador to the UN during the vote on Resolution 181 which had been adopted 70 years earlier. "We cannot forget the unique Uruguayan Ambassador to the UN in 1947, Ambassador Fabregat, and I know that your former President is here today to receive the Jerusalem Prize along with Ambassador Fabregat’s son, at a time when we are celebrating the decision of the United Nations to recognize the need and the moral right of the Jewish People to return to our homeland." 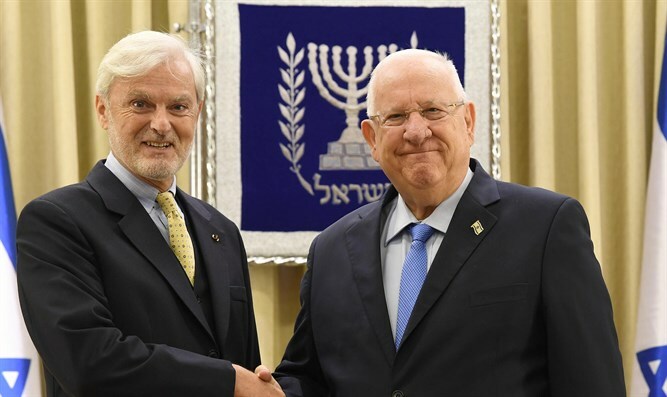 Rivlin also spoke of the close relationship between the two peoples and noted that the President of Uruguay held a post-doctorate from Israel's Weizmann Institute of Science.. Ambassador Greiver thanked Rivlin and noted, "Today is a symbolic day, seventy years ago Uruguay did not just vote for the resolution, the Uruguayan permanent representative to the UN was the one who drafted the resolution that was approved." He spoke of the long history of diplomatic relations between Israel and Uruguay, and of the current cooperation, in particular the free trade agreement through the Southern Common Market (Mercosur). Greiver expressed his hope that the peace negotiations between Israel and the Palestinian Authority would be renewed. Rivlin replied that the Palestinian Authority still denied Israel's right to exist and that the trust between the sides should be restored. Rivlin then welcomed the Papal Nuncio, Archbishop Leopoldo Girelli who presented his diplomatic credentials on behalf of the Vatican. "This is the land, and this is the city where it all began. 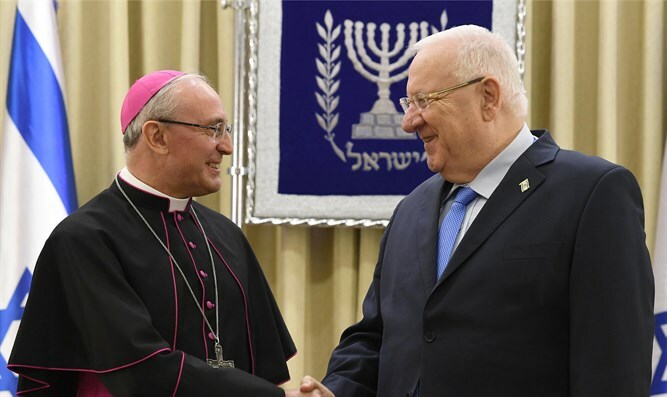 We know this city is holy to Jews, Christians, and Muslims - it became a political issue but this is the city of G-d," Rivlin said, stressing his appreciation for the Pope’s efforts and commitment to build understanding between different faiths. "There is only one G-d, and everyone worships Him according to their traditions, but we have to respect each other because we are all children of G-d. I had the honor to visit the Pope in the Vatican. We spoke of the efforts to bring cooperation between the different communities in the Holy Land, and of Israel’s efforts to develop the Land of Monasteries on the banks of the Jordan River to allow for more pilgrims to visit from around the world. "We are doing everything in Jerusalem to allow everyone to worship G-d according to their belief." Thanking Rivlin, the Archbishop said, "I take this opportunity to convey to you Mr. President, the greetings and the blessings of the Holy Father. Pope Francis has the Holy Land in his heart, he is very close to its people. The Pope wishes to stress the importance of dialogue, of tolerance, of mutual understanding. Through dialogue we really can achieve peace and security." Rivlin invited the Pope to visit Israel as part of the 70th anniversary of the establishment of the State and said. "The Pope has a message for all people all over the world," Rivlin said. "He is doing much in the fight against anti-Semitism."